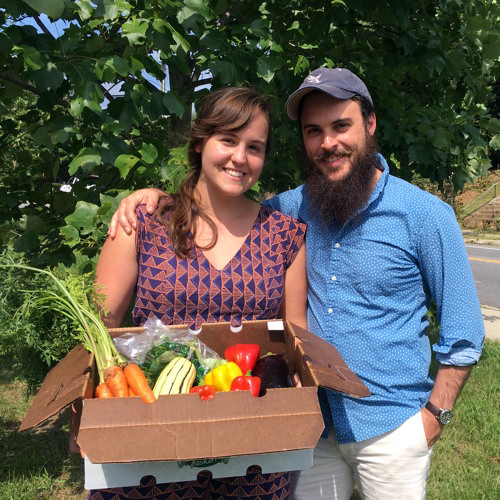 Macon York Costlow and her husband Luke Costlow pick up their CSA share from Gaining Ground Farm from the RAD Farmer’s Market. Photo by Jen Nathan Orris. It goes without saying, the classes are the heart and soul of this great conference. Each class is 90 minutes long, which allows for plenty of time for a thorough presentation and usually time at the end for questions and answers. Below are the three classes that I’m planning to take. From herbal medicine to organic gardening, from animal husbandry to community tending, traditional Appalachian culture has survived for generations by living off and with the land. Modern homesteaders can learn much from the living cultures of Appalachia as Byron Ballard provides an overview and template for this timely and needed revival. While I have been eco-conscious most of my life, it was not until I moved to Asheville in 2013 that I became interested in homesteading and permaculture. Every year my husband and I bring more of these practices into our life (organic gardening, composting, fermentation, canning, meal-planning, and herbal medicine). I’m inspired by traditional Appalachian culture—living deep in the mountains typically meant limited outsourcing and having to use what was available, which I imagine created a natural and very real sense of humility and gratitude. I’m excited about this class because it will address all of my current homesteading efforts and future dreams (chickens, goats, humanure, sourdough baking, cheese-making, and brewing beer and mead) in a big-picture sense. I’m glad for the chance to meet Byron Ballard, who is a freelance writer, ritualist, rootworker, teacher, energy healer, urban farmer, and a native of the Southern Appalachians. She offers workshops, lectures, and a year-long curriculum on traditional mountain culture and earth-based spirituality, and herbal wisdom. She one of the founders of Mother Grove Temple in Asheville, NC. I have a core belief that 90% of good health is simply being rested and hydrated. And yet, getting enough sleep is an ongoing struggle for me. When I’m rested, I have much more energy and focus in my day, and I tend to be in a better mood. As an artist entrepreneur with a letterpress studio, Cotton Blossom Press, I find that rest is crucial to my creativity and productivity. Luckily, herbs can help achieve a good night’s rest. Patricia Kyritsi Howell will be teaching how to create an effective, easy sleep plan using herbs. I think this class will be extremely helpful for me! Last fall, I attended another class by Patricia at the Southeast Wise Women Herbal Conference, and I have great respect for her wisdom and experience. She is an herbalist, clinician, author, and teacher with more than 25 years of experience. She is the director of the BotanoLogos School of Herbal Medicine in the north Georgia mountains and the author of Medicinal Plants of the Southern Appalachians (2006), an essential reference for regional herbs. Making Mead has been on my list of dreams for the past few years, and I’m delighted to take an intro-level class at the Harvest Conference. In my opinion, mead is such a magical (and delicious!) elixir, a beautiful combination of two things I dearly love: honey and wine. The ancient art of mead-making mixes honey with fruit, flowers, roots, and herbs to create beverage bliss. I’m thrilled to learn all that this class will cover: handling, harvesting, preparing ingredients (including ratios and qualities of sweeteners and yeasts), bottling, and storing. This class focuses on wild, open, and cultured fermentation. Marissa Percoco sounds like an incredible woman. She is an avid fermentation enthusiast who spent the past seven years exploring fermented cultures, local plants, and how the two come together. Traveling through the wild places of TN, FL, CA, CO, UT, OR, WA, and HI, with her four amazingly adventurous children, Marissa has gathered wisdom from cultures far and wide. While the classes are so informative and inspiring, there are other wonderful aspects of the conference I’m looking forward to as well. Warren Wilson may be a college, but to me it feels a bit like summer camp. This earthy campus is so warm and inviting. I plan on bringing a picnic blanket to enjoy some sunshine during the lunch break and review my class notes. The small market of vendors is really quite amazing. I love talking to growers, makers, shop-owners, non-profit organizers, and vendors in the time between classes. Bring some cash because there will be many irresistible goodies and resources available for purchase! As my busy summer begins to wind down, I love giving myself a day to just LEARN. During my work-week, I’m constantly creating and doing, so it’s such a treat for me to sit back and absorb knowledge and wisdom from those who have more experience than me. I savor every second.